At an altitude of 1612 meters and surrounded by majestic mountains along the spine of the Atlas range, the Hotel Xaluca Dades enjoys a privileged location offering guests panoramic views of the Dades Valley, sprinkled with friendly Berber villages and snowy peaks. 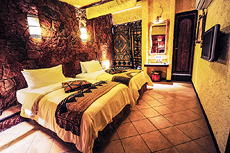 The 104 rooms at the Hotel Xaluca Dades boast exposed stone walls and are decorated with both modern Moroccan décor and styles from other African countries. 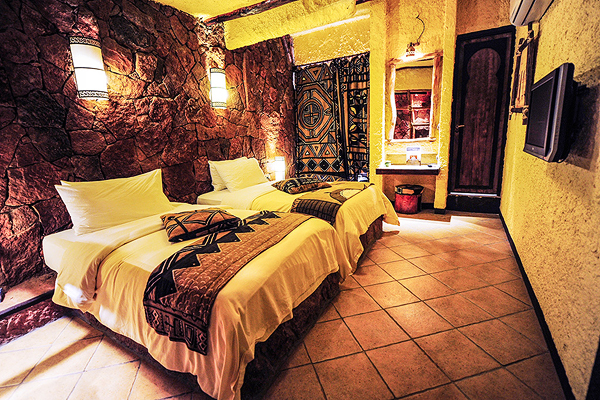 Each room has air conditioning and radial heating, Wi-Fi, flat screen TV, mini bar, and safety deposit box. The private bathrooms feature a shower, hairdryer and complimentary toiletries. 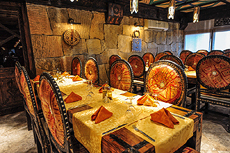 The restaurant at Hotel Xaluca Dades offers a wide range of Moroccan specialties as well as international cuisine in their elegant dining room with panoramic views. 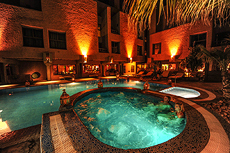 Unwind by the outdoor pool and Jacuzzi while enjoying a snack or drink from the bar. For more relaxation, visit the Spa & Hammam to indulge in a variety of services. For something more active, swing by the fitness room or tennis court.